Expert Review of Jumparoo Boing! II Pogo Stick by Air Kicks, one of our picks of the top Jewish books for kids! What makes the sturdy, all-metal BOING! stand out from others? First there's the Y-shaped handle with foam grips that offers more hand positions than standard pogos, and greatly increases its control and ease of use. Even klutzy kids can step right on and bounce. The rugged metal spring is completely encased by a steel housing, so there's no possibility of pinching, and all surfaces are rounded for extra safety. Even the rubber "foot" is superior. Its 3" diameter is twice that of most pogos, for greater security and stability. 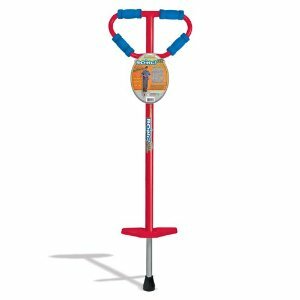 Jumping sticks have been getting more popular, as kids see them on TV and parents realize the value of activity to their child's health. A boon to balance and a great calorie burner, our BOING is so fun kids don't even realize they're exercising! Great uncommon bar or bat mitzvah gift, too!